The Men's A-Team was founded in 1957 and is the backbone of the soccer program. The team currently plays in the Hamilton & District Premier Soccer League's Elite Division. Croatia also competes in the Croatian National Soccer Federation's North American Tournament held every Labour Day weekend at sites across Canada and the United States, as well as the H&D League Cup and the Hamilton Spectator Cup. In the past, the team has also competed in the Ontario Cup. 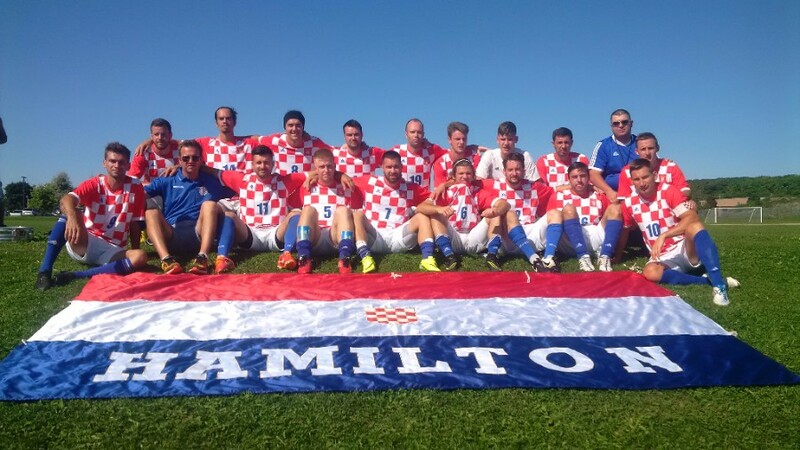 In 2013 the Hamilton Croatia Men captured the H&D Premier League title with an undefeated record of 14 wins and two draws, then continued their streak into the post-season and defeated East Hamilton 76 in the Premier League Playoff Final. Finally, they capped off their tremendous season with a 5-0 win over East Hamilton 86 in the League Cup final to complete the treble and finish the year undefeated. 2014 was much of the same, with the team winning League and Cup honours — the playoffs were not played, but we're sure the boys would have completed the back-to-back treble. In 2015 the A-Team fell just short of expectations, but rebounded nicely with their third league title in four years last season. For the 60th Anniversary season in 2017, we would like to wish good luck to Coach Glazer, and all the best to the returning and new players. This is a special season for Hamilton Croatia as an organization, and we hope that the team's preparations and hard work will pay off with yet another league championship! Read more about the team at our wiki page.